Unique way to convey thanks in a tangible way. Appropriate for any member of the ministry team. Design features one of the lovely windows at the Cathedral-Basilica of Notre-Dame in Québec City. 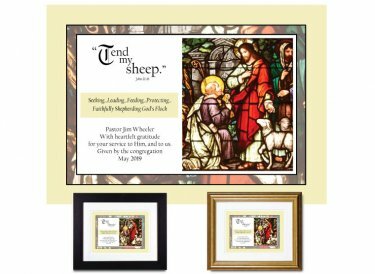 You'll personalize this custom-finished plaque with the name of your pastor, priest or lay minister - then add your own special message (the four lines of text at the bottom of the sample pictured here). Original design. Hand-finished using premium archival materials. Framed & Finished - Printed on premium paper with archival inks and double-matted with conservation-grade matboard as above; mounted using acid-free foam core backing; framed using distortion-free UV acrylic glazing. A protective dust cover and wall guards are applied to the back. Your choice of gold or black wood frame (view frames here); ready to hang. Finished size: 10"x12"